Does your tech team want to waste their precious time on inefficient desktop computers? Unlikely. You could buy new hardware—that seems like a smart solution, right? Only problem is keeping up with technology advances isn’t. Got a plan B? Lower operation costs. With Office1’s services, you can create and delete your virtual desktops as needed, putting an end to those hefty investments in PC and hardware you don’t actually use. Streamlined management. Each virtual desktop can have a unique setup based on your department’s needs, including different software and resources. 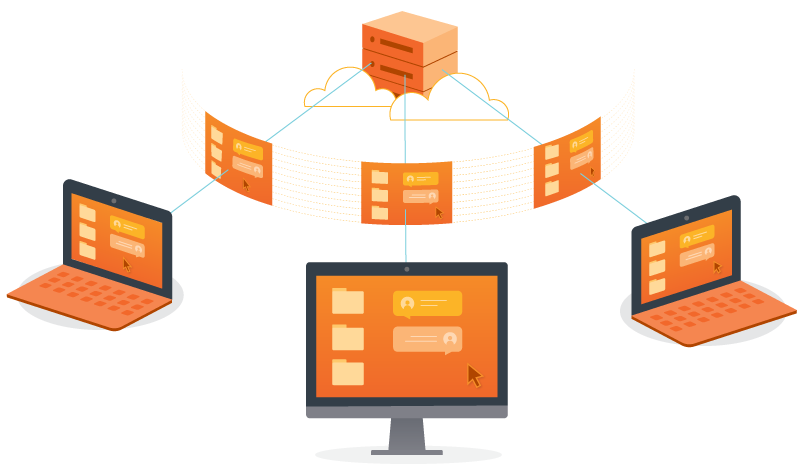 Our third-party cloud infrastructure can serve multiple users at once with ease. Better continuity/disaster recovery. Virtualizing your desktops with DaaS means less risk during power outages, cyber-attacks, and hardware breakdowns. Your information isn’t stored in-house, so it remains safe and sound when disaster strikes. Talk about a lifesaver! Enhanced security. With DaaS, you’ll cut out traditional desktops risks, like malware and costly technical difficulties. We manage your infrastructure from top to bottom, improving data security. On-demand infrastructure deployment. With the flexibility to meeting fluctuating needs with ease, you can save money, meet peak requirements consistently, and maintain sufficient resources. Reduced space requirements and energy costs. Save space in your office and eliminate the unnecessary energy costs of powering standard hardware. Remote data storage. Enhanced security. A seamless remote experience. Sound good? Making it happen is simple. Just let us have a look at your current hardware situation. We’ll then draw up a smart, customized plan of action. You’ll be surprised at all the ways DaaS can optimize your company’s computer use.